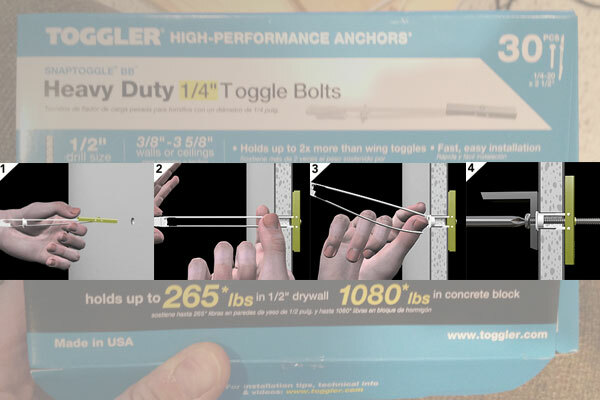 Currently viewing the category: "Toggler"
You know how regular toggle bolt wall anchors always require extra space behind the drywall, and to remove you unscrew them, dropping the toggle behind the wall? This week I found the best toggles I’ve ever used — SnapToggles, made by Toggler. They’re much easier to install, and they stay in place when you unscrew the bolt. They’re odd-looking, which probably explains why at Lowe’s I found a box opened and a few scattered around the wall anchor area. While traditional toggle bolt anchors consist of a single bolt with “wings” at one end that pop open after being pushed through the wall, the SnapToggle’s two parallel plastic straps tee into a single bar-shaped anchor. The straps can move up or down independently, see-sawing the anchor to form an “I” or a “T” as needed. To install, simply push the toggle long-wise through the hole you drilled (generally a half inch, or about what you use for a medium-to-large standard toggle), then line up the straps to flip the toggle 90 degrees. Next, push the cap along the straps, zip-tie style, until the toggle lies flush behind the wall, and pull the toggle tight with the straps. Finally, just break off the straps flush with the cap. The cap and toggle stay in place, allowing you to install the bolt whenever you like.